Paradise ponders, snowy future edition... 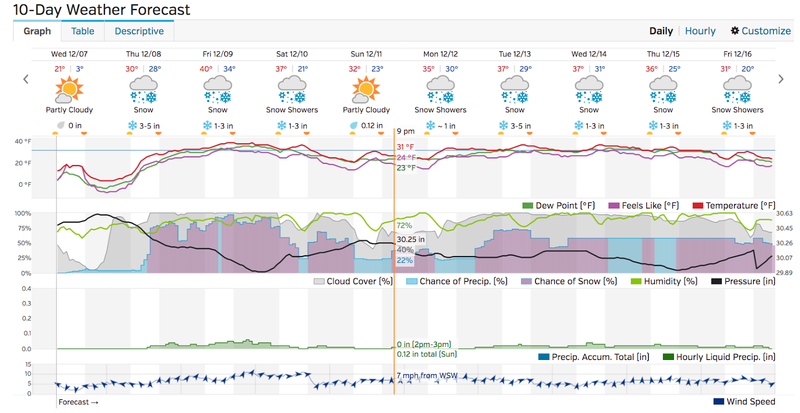 Check out our ten day forecast at right (click to embiggen). All that purple area represents periods with a significant chance of snow. If we were to hit the maximums on the snow forecasts, we'd have 26" of snow on the ground. Yikes! I did a bit of electrical work on the mud room yesterday, including the only challenging bits remaining (locating the holes I'd cut into the OSB sheathing before wall board was put up). I've got a half hour or so to do today, and then the mud room is completely finished and ready for the cabinet maker to get started. Woo hoo! Well, come to think of it, that's not quite true. On the outside of the mud room I have yet to mount a doorbell switch and the house numbers. Next spring, when the ground becomes workable again, we'll be putting in a walkway to the driveway, putting stone over the concrete porch, and mounting railings. So probably I should say the mud room is now usable. Still a huge milestone for us! Yesterday we had a load of firewood delivered, the first firewood we've actually purchased up here. This is because we now have an actually working fireplace that we are using on a near-daily basis, and we've run through all the split firewood our neighbors gave us. Also I wanted to get hardwood instead of the (mainly) softwoods we've been burning; it burns cleaner and hotter. So I located a source, and he delivered his last available load of hardwood yesterday. It's about 2/3 of a full cord, nicely cut to 16" or shorter, and split in a nice mix of sizes. It's all dry, and best of all, it's all a mix of species: black walnut, black locust, oak, maple, ash, plum, apple, Chinese elm, and some others I can't identify. I feel guilty burning some of this stuff, as it's gorgeous. In fact, I've asked the vendor to save me some full logs (not split) for turning on the lathe next year. He gets all this wood from the tree trimming he does, so it's all from people's yards within about a 50 mile radius. We had our first fire with this wood yesterday evening, and it was all we'd hoped for: five piece of wood burned like a blast furnace for six hours; our heater didn't run at all in that time. The recirculating hot-air system in our fireplace works great with such a hot fire. One thing I didn't really anticipate: the hardwood smells good when its burning. So far the plum wood is my favorite for the aroma.